After the prettiness of Ljubljana and the refurbished refinement of old Zagreb, Belgrade is care-worn and world-weary. Dirty, hectic, blisteringly hot, but with the vibe of a great city waiting to emerge and face another day too. 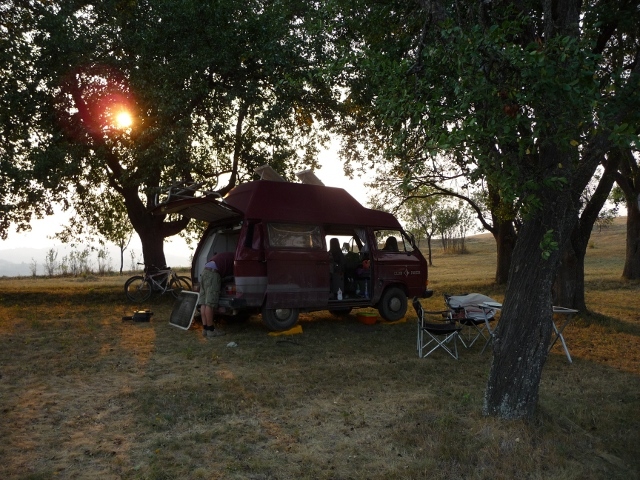 Would we have enjoyed it so much if we hadn’t had Uroš to show us its secrets and hotspots? 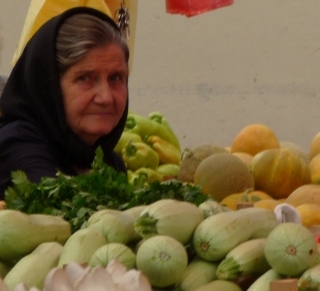 It was just a short walk from our hostel to the centre of town and we started with a wander round the market with its bescarfed old ladies and tempting shiny fruit and veg. Onwards through the main pedestrianised thoroughfare of Knez Mihajlova towards the Kalemegdan citadel. 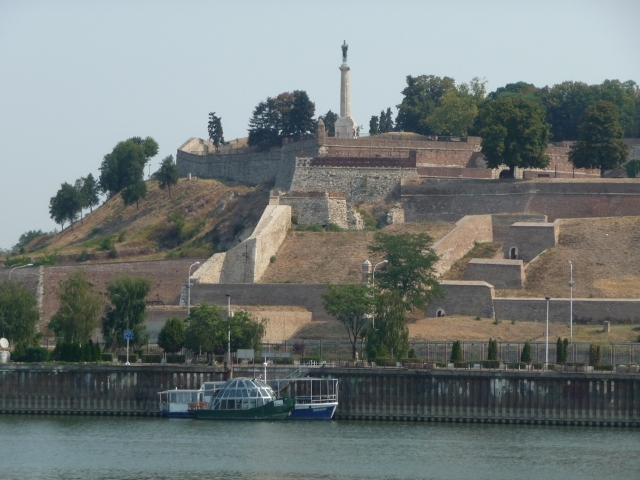 Constantly fought over during centuries, it sits at the helm of Belgrade overlooking the confluence of the Danube and Sava rivers, commanding views way up the Danube and over to the river island of Ada Ciganlija. 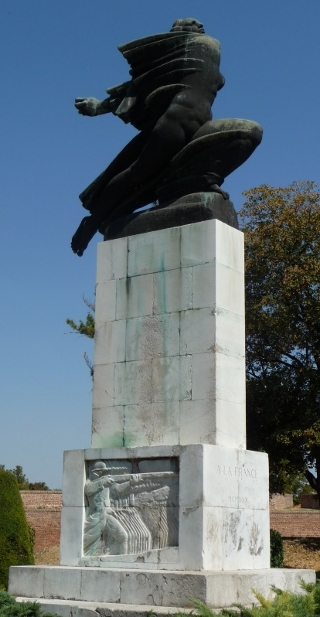 We wandered in parkland, past the striking Ivan Meštrović sculpture of Victory, and through the walls. There was a whole range of armoured vehicles starting with miniature tanks on display – part of the military museum. Within the walls the parkland continued and we came across two small picturesque orthodox churches. On the way back we walked via Skadarska – a street in what was originally a Roma shanty, then rebuilt in the 1830s with homes for artisans and poorer civil servants and became the haunt of the city’s bohemians during the early 20th century. Still an arty quarter, it is lined with restaurants and bars. A lunchtime in August was perhaps not the time to see it at its most atmospheric, but we ate lunch at one of the outside tables and watched the few people go by, go by, fending off beggars and a would-be artist clutching a few badly spray painted boards. The heat radiated off the city’s pavements and buildings – around 40 degrees of it. We made our way down the shady side of every street back to our hostel hideaway for a siesta and chill out time. Uroš’s plans for us that evening started with a drink at another bar nearby, where we were joined by Aca and his superb lime-green 2cv. 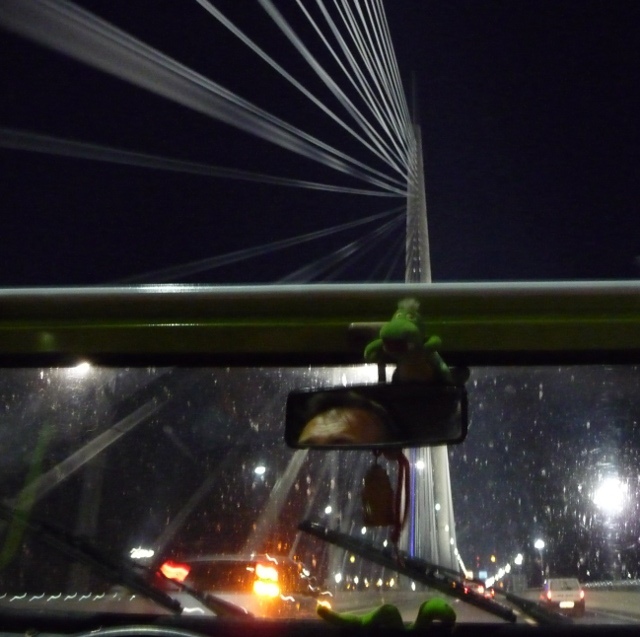 We whizzed across bridges, including the magnificent new cable-stay Most na Adi, only opened on 1 January 2012. 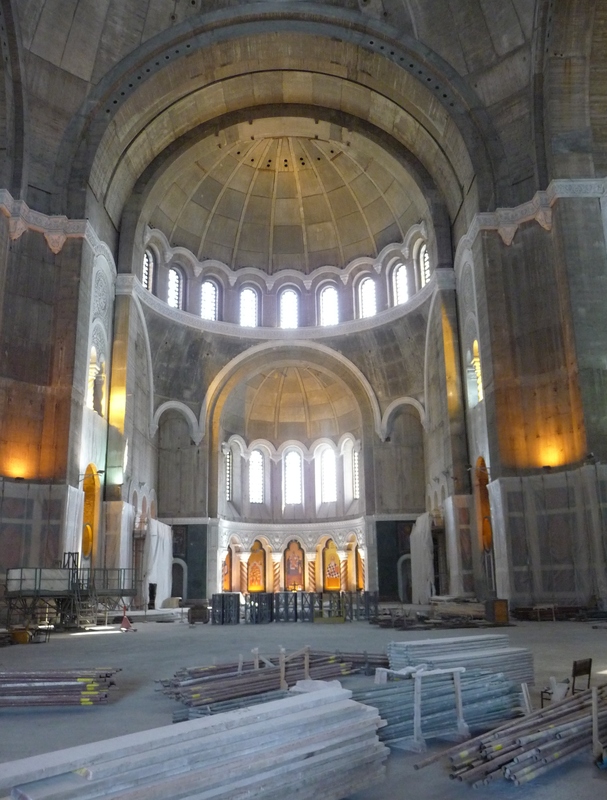 We zipped by some more of the major sites like the temple – a huge unfinished orthodox cathedral all lit up, Tito’s and Milosevic’s former homes in a classy street of massive houses – a bit like London’s Bishop’s Avenue, around and about. We ate at Fabrika – traditional food with a twist. Everything was served very stylishly, perhaps overly so with little frying pans and sauce pans on slate plates. Our Serbian pals were sad that it had gone a bit up-market. But the food was excellent. We were jauntily driven back to our funky hostel via the street where the bombed ruins of military headquarters still stood on either side. A poignant reminder that Nato forces shelled Belgrade for nearly 80 days back in 1999 during the Kosovo war. 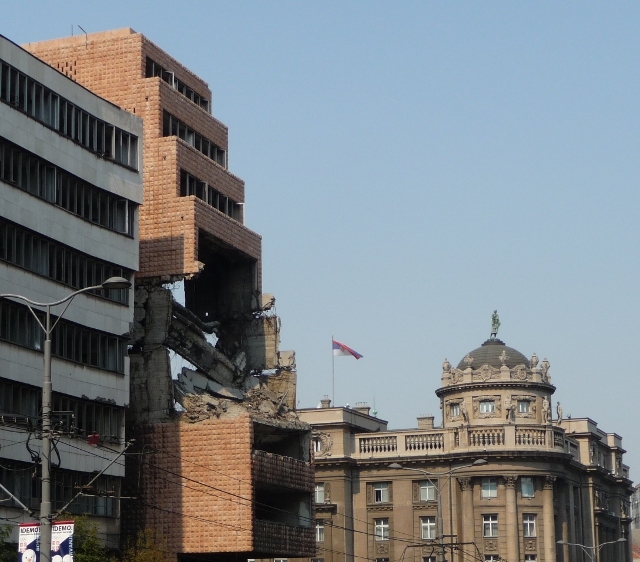 Uroš remembers seeing these buildings being hit while sheltering in a flat not faraway. Next morning, we retraced a few of last night’s steps to see things in daylight. We got on our bikes amid scary city traffic to take a look inside the temple – more unfinished on the inside than the outside, but a corner of the cavernous structure is in use for worship, icons pinned up on builder’s fencing. We also came past the shelled buildings in daylight too – the military headquarters had been very carefully targeted. 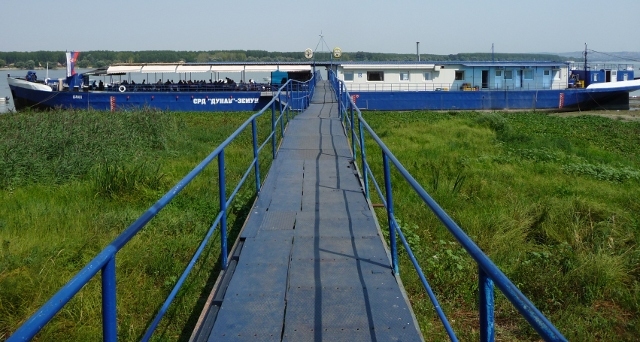 After trying to cycle in city traffic, avoiding trams and tram-tracks, it was a relief to cycle over the bridge and along the Danube on cycle paths to Zemun, a small outlying rather picturesque town – more in the Hapsburg style. After exploring the cobbled streets which took us to the top of a hill where the Millennium tower sits with a large cemetery opposite, we found our way, first to a welcoming lounge bar for a cold drink and then along the river bank to a big barge reached by a rickety walkway – a restaurant, where we gorged on trout and white wine for very little money. It was a cycle back in the heat but allowed us time to get enough rest for the evening. 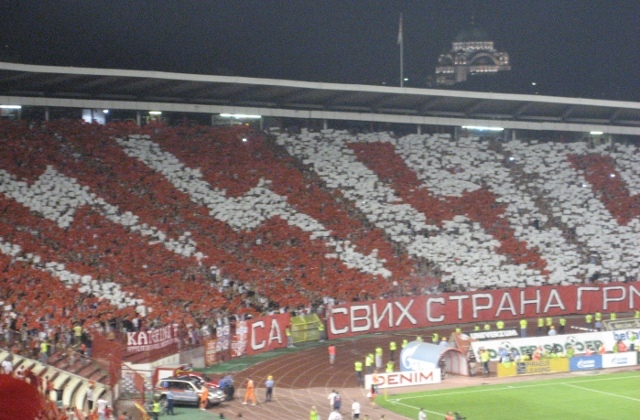 We’d only intended to stay a couple of nights, but Uroš invited us to attend a big football match. Red Star Belgrade were playing Bordeaux in the UEFA qualifiers. Never having been to a football match before we were very keen to go – especially to experience the expected atmosphere created by a very vocal and boisterous home crowd. Uroš works behind the scenes on ticketing the team’s matches. As we neared the stadium, we abandoned our taxi and braved the thronging crowds. Adrian bought a scarf to try to blend in a bit. It took a little while to find Uroš and he took us up to a quieter ‘safer’ section of the stadium. I was frisked on the way in and was found to be carrying an offensive weapon which was confiscated (though luckily Uroš was able to look after my biro until after the match). The supporters were as loud and lively as promised, singing and chanting the whole time – an electric buzz and we joined in when we could. A tiny group of about 30 or 40 French supporters were ushered into an empty section at one end, huddling together madly waving flags and scarves. It was a draw, but Belgrade certainly seemed to play a better match. Unfortunately on the 2nd leg in Bordeaux they lost and are out of the tournament. Next morning, after working hard following the game, Uroš came to take us out for breakfast and say goodbye, and we also bade our farewells to Andrea and his wife Ivana. We wished we could spend more time there, but the city heat was oppressive and we were heading for some slightly cooler countryside. 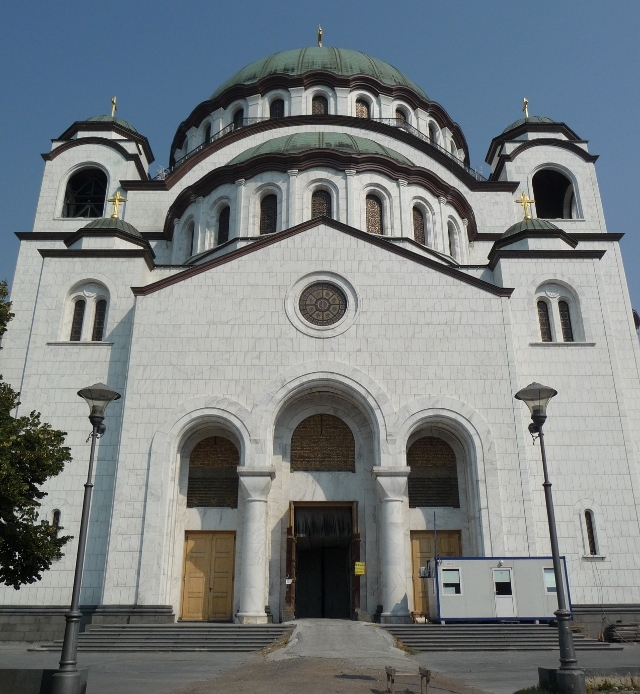 We thought it unfair on Serbia just to see Belgrade, especially as we’d been made to feel so welcome. We only got on the road as far as the street with the cool hidden away bars on it before the petrol pipe which Adrian had fixed in Samobor, just a few days before, died. The pipe turned out not to be up to carrying fuel and had ruptured, spilling our precious petrol onto the streets. It had to be mended again at the side of the street. Luckily there were friendly mechanics nearby who could point the way to a car spares shop and supplied hand washing facilities after Adrian had fitted the new section of pipe. Our engine being at the rear, the bikes had to be taken off the back and all the stuff such as bedding, chairs, table and so on that we store at the back had to be moved forward. All in the heat as trucks thundered past. Still within an hour we had managed to get it sorted and were off. It was a bit too long a way to drive to the south west in one hit, given that we’d had a late start from the city, it was really hot, and the roads were slow. Before we got to our destination, the new petrol pipe failed. We couldn’t believe it. By this time it was heading towards 6pm, but off the bikes came and all the stuff was moved back and forth again. We had it fixed again shortly though – although not impressed with the pipe we’d bought we prayed it would hold until we could find something more lasting. It was too far to get to the campsite we wanted to go to, so we went to one in the wrong direction but a bit closer at Ovčar Banja. It was the one that users of the camping review website had given bad reviews to. It was bearable for a night. Not many ‘touring pitches’, the rest of the smallish site taken up by permanent caravans, some of which had been there aeons. Although looking ‘dead’, they were still very much in use by the last few Serbian families on summer vacation. The ablution facilities were dire, but it was cheap and we pulled in alongside a friendly French couple in a motorhome who were also touring the Balkans. Next day, we headed for Čačak to find some better petrol piping. We did so. Then headed west, but the campsite we’d first planned to get to didn’t live up to expectations and went further south to another goal – the Uvaz canyon. We found out about a campsite not too far from there, so aimed for this. Down a dirt track with sparse signage, we eventually came out on a grassy hilltop. We were thankfully shown to a shady spot in an orchard before being lead to the house for coffee and sljivovica. Adrian then fitted the new petrol piping yet again. The newest one was already showing signs of distortion. It seemed to be hard to buy piping of the standard and quality needed for fuel. When we did find it, it was hard to get the right size. It had been a very frustrating couple of days on the van petrol pipe front. This entry was posted in Art & Culture stuff, By Country - Serbia, Food stuff, Van stuff. Bookmark the permalink.